So you would like to go to a match with The Irish Toffees? Well it all starts here! First things first - make sure to join The Irish Toffees and then register with Everton for your E-ticket number! This form is our official booking system. Enter your order below, you will receive an automated response soon after, a copy of your order, and you will be kept informed of the order. 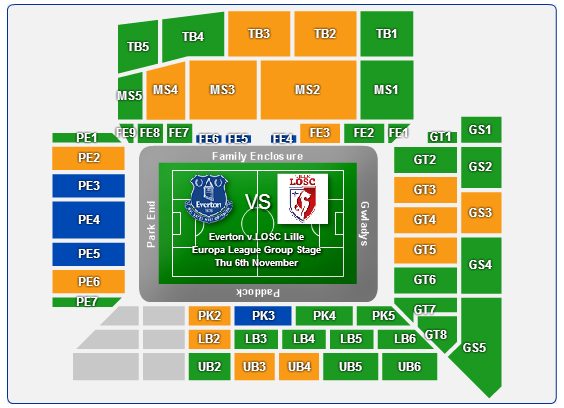 Please make sure you all have a valid eticket/customer number which you can get from Everton using the link below. If you don't have one please register for one asap. As an Irish Toffee member and to improve your chances of tickets to high profile matches please support your club by purchasing match tickets through The Irish Toffees. For match ticket bookings, please use this form in the first instance. For follow up ticket enquiries on your order you can email bookings@irish-toffees.com or tel 086 3837866 (086 EVERTON), you must quote your unique reference, starting with 'IT2019'. This image is just a guideline for showing you the names of the different areas inside Goodison Park.